Technology developed by head of Weizmann's Science Energy Center creates mixture that can be used for car fuel. 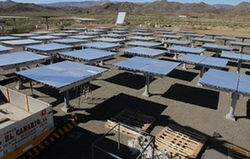 Israeli startup NewCO2Fuels Ltd., in partnership with Australian firm Greenearth Energy Ltd., has acquired the license for a technology developed by Prof. Jacob Karni, head of the Weizmann Institute of Science’s Energy Center in the department of environmental sciences and energy research, as well as supervisor for the institute’s solar program. Karni’s research, which was conducted in partnership with Dr. Avner Rothschild from the Technion, received a $200,000 grant from the Silicon Valley-based organization Israel Strategic Alternative Energy Foundation in 2010. “The process becomes much more effective if it’s performed at much higher temperatures,” he said. “We would like to produce methanol that would be cost competitive to gasoline,” Banitt said. While the solar reactor technology can be applied to any type of emissions that include carbon dioxide – essentially, all fossil fuels – brown coal, which has an extremely high presence in Victoria, Australia, emits enormous amounts of carbon dioxide. Brown coal features about six to eight time more carbon dioxide than, for example, natural gas, and therefore, Australia has limited its use. “The possibility of converting carbon dioxide to fuel in a clean and efficient manner will turn brown coal into a source of environmentally friendly fuel,” the Weizmann Institute said.